Christmas shopping can be hard. Especially if you're like me. I should be given a shopping handicap like I get in golf. Spot me a few strokes and it's game on. So during this holiday season I have painstakingly come up with 12 DIY projects that just happen to make great gifts. "But Stan, it's a planter and it's Christmas time. Planters are for the spring." Well I says, who doesn't think about and start planning for spring, espeicially during the winter months. We all long for those warm sunny days when the frost is gone and the flowers begin to bloom. So give a gift in the winter that will keep your loved one as hopeful and excited as a child on Christmas eve. 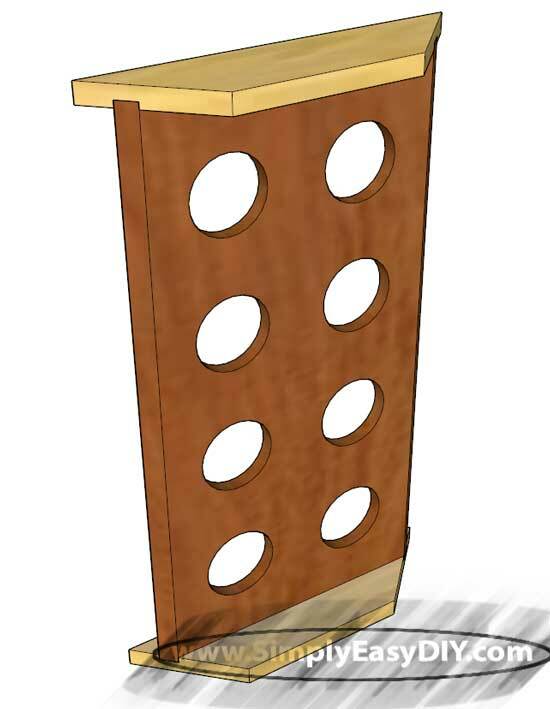 8 Top & Bottom Ridge Caps @ 3.5" x 19"
8 Trim Pieces @ 1.5" x 18-1/16"
20 Vertical Side Slat Pieces @ 3.5" x 31"
Lets start with the side panels. Each of the panels are edge glued 1x4s. 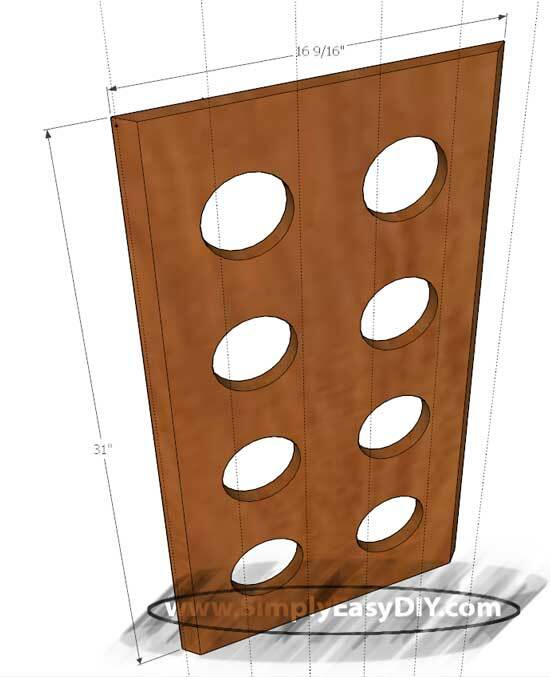 Five 1x4s give us a panel that is slightly wider than the final width listed above. This is by design. 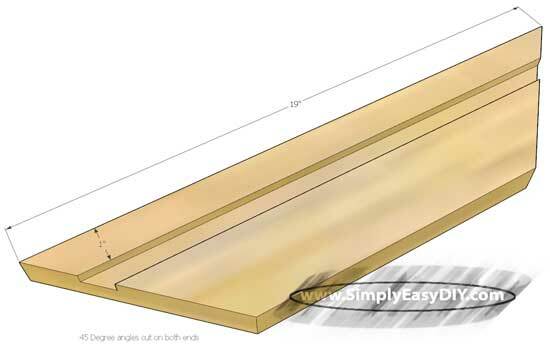 Whenever you will be cutting angles into boards you always want to make that board(s) longer or wider than the measurements listed in a cut list. 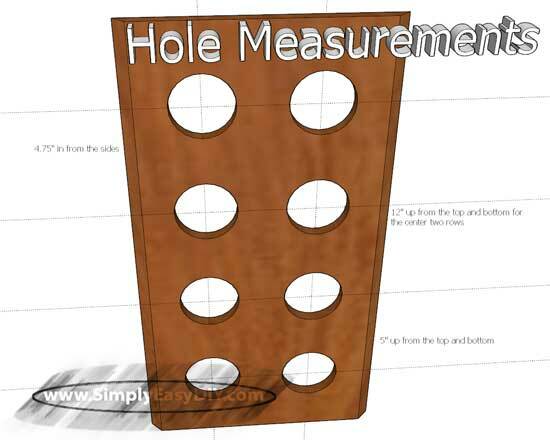 Don't worry about the holes at this point even though they are pictured below. Once the panels are dry take them out of their clamps and cut a 45 degree angle on both sides of each panel. After that is done we can measure, mark and cut the 3" holes into each tower garden panel. If you don't have a three inch hole saw or a hole saw kit for that matter, not to worry, they are cheap and easy to find. Measure 4.75" in from each side. Be sure to measure and mark from the long side of the board and not the short angle side. 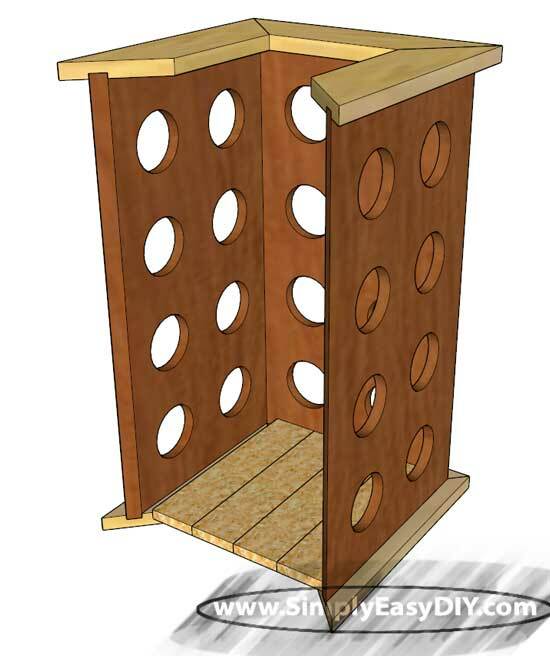 Then it's 5" up from the top and bottom and 12" respectively for the middle sets of holes. 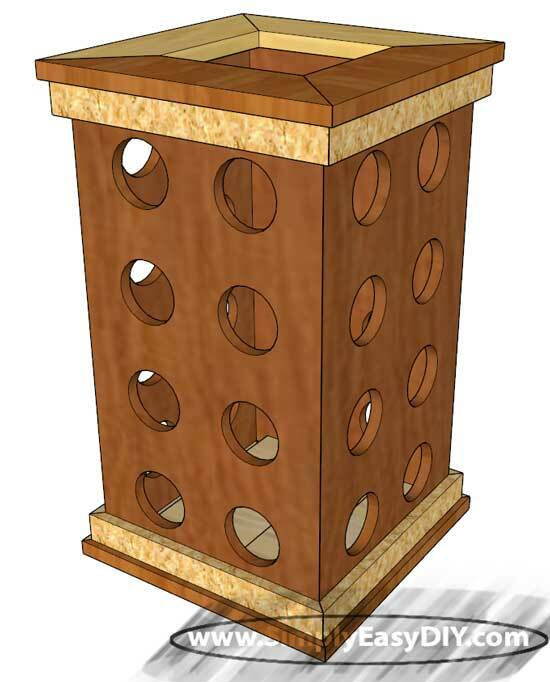 Now it's time to turn our attention to the ridge caps that will be positioned on both the top and bottom of each side. Again cut your boards longer than needed in the cut list above. Adding 2" to 3" to each board should give you enough wiggle room to get both angles cut and not come up short on the length. However, before you cut the angles into the pieces set up a straight bit in a router table and route a 3/4" wide dado 1" from one side of the board. 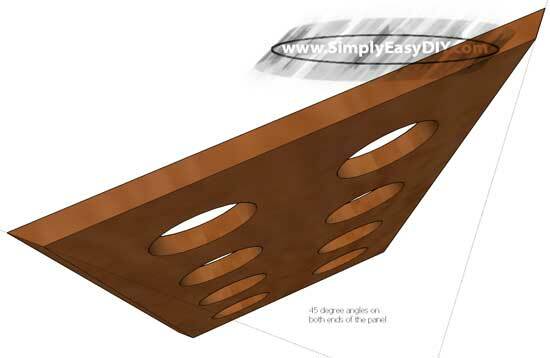 Apply wood glue to each dado and position the side panels in each. Now we can start to assemble the four sides. Proceed with a light touch from here on out until you can get some clamps in place. Applying pressure evenly and a little at a time is the key to a mitered glue up. Yes it can be frustrating but that frustration usually comes from applying to much pressure in one direction from one clamp which pulls the whole project out of square. Then pieces start falling to the table and we all wonder how the guy in the video made it look so easy. A band clamp comes in handy for things like this. It can hold the four sides in place and squared up while straight clamps are applied and slowly worked tighter. Alternatively you could use a joinery method that references one piece to another such as biscuit joinery. 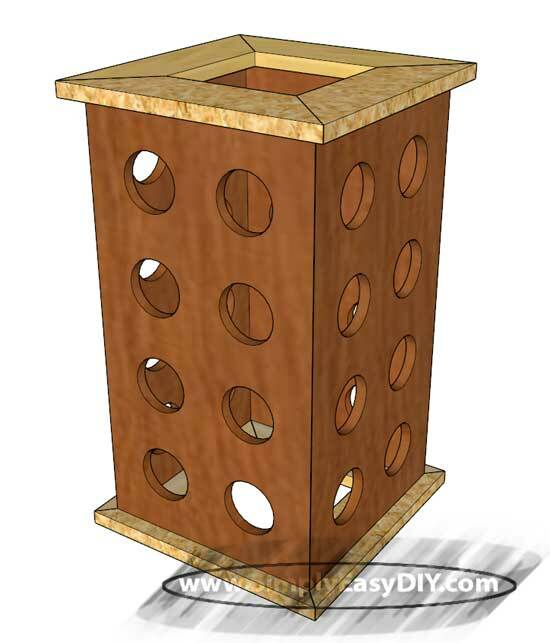 A few 1x4s cut to length can just be laid in place in the bottom of the tower planter. No need to fasten them in place as the dirt will do that. NOTE: One side has been removed in the picture for illustration purposes only. This step is optional as it is for aesthetic purposes only. Cut some trim pieces to length. Then cut 45 degree angles in each side and glue them to the outside of the project just below the top ridge caps and just above the bottom ones. You will notice in the video that I did not do this step. That is because I choose not to add the additional expense and material for something that is purely for looks. However, I have added it in these plans just in case someone does want them. Simple glued up miter joints will NOT be strong enough to hold this project together. The corners will pop loose inside of a day or after the first watering. The reason is because the wood will expand and contract thus popping the joints. 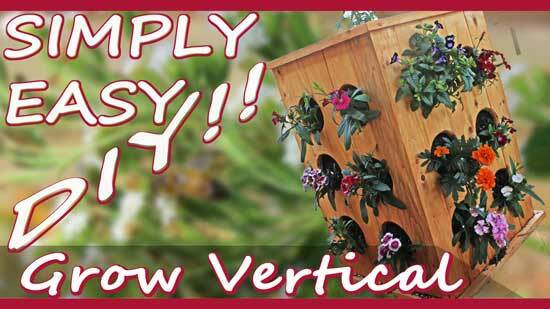 I used dowels through the corners to add strength and visual appeal to the vertical tower planter. The dowel rods come in 36" length from any local home improvement store and cost around $1.50. 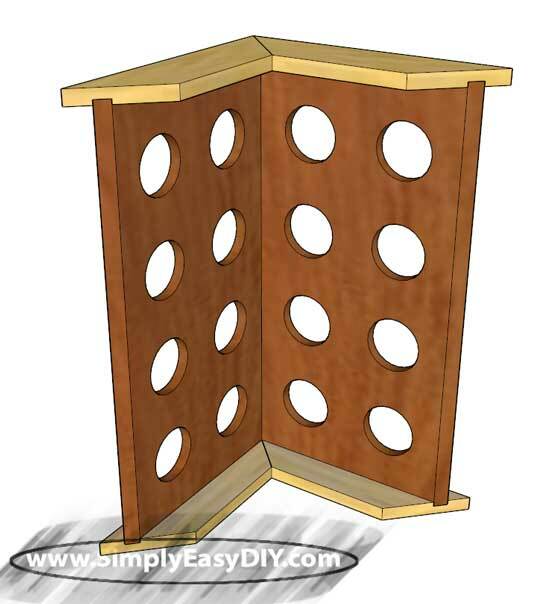 Cheap joinery that is functional and looks good too. Win, win. As far as protecting you new gift giving idea I used a cedar colored deck stain. If you are not using all of the spaces provided for plants then you may be wondering how to keep the soil from falling out of the project. Well, you could cover the holes from the inside or do what we did and just leave them open. I put my hands over the holes while someone filled the tower with dirt until it was above the top of the hole I was covering and at that point the dirt just stayed put. I can't defend it, it just does. I hope you enjoyed our 1st Day of DIY Christmas Gift ideas.